As a member of AAP NY Chapter 2, you will be a voice united with over 4,100 pediatricians in the NYS AAP, working to achieve optimal physical, mental and social well-being for infants, children, adolescents and young adults, and to improve the practice of pediatrics in New York State. What is the value of joining AAP NY Chapter 2? What have AAP NY Chapter 2 and the NYS AAP done lately? Foster Care Conference – Links to the lectures are here. Chapter President Steve Goldstein’s most recent Update Letter. See the presentation provided at the June 2018 Wellness meeting. Read the NY Docs letter (to which New York Chapter 2 has signed on) to the New York legislature regarding funding for health care programs that are essential to health care delivery in New York State. 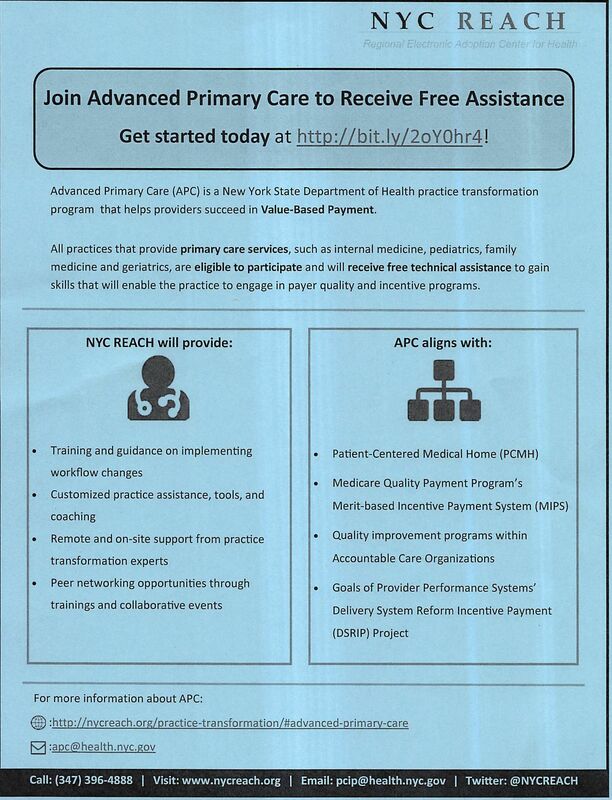 Advanced Primary Care (APC) is a NY State DOH program that helps providers succeed in value-based payments. Free assistance is given to gain skills that will enable you to engage in payer quality programs. See the flyer for more information or go to the website. NYSDOH, in partnership with NCQA, has developed a New York specific Patient-Centered Medical Home model, known as, NYSPCMH. The newly designed NCQA PCMH 2017 model is distinctly different in design than prior programs and NYSDOH has embraced these changes in support of advancing primary care and pediatrics throughout the State. Read more here. Congratulations to Chapter 2 Vice President, Dr. Shetal Shah, and all who worked on and attended the May 23rd vote of the Nassau County Legislature, where a bill that we worked on for the last 10 years passed unanimously. This important bill raises the age to purchase tobacco and related products, including e-cigarettes, to 21. Nassau County will finally join Suffolk County and all of NYC in complying with Tobacco 21. This is a big win for our Chapter and the children we care for! Robert Lee, DO, MS, FACOP, FAAP, for his work on the Chapter Foster Care Committee and deep, ongoing commitment to the chapter. Kenneth Bromberg, MD, FAAP, for his unflagging advocacy for immunization initiatives and his mentorship of the Chapter Immunization Quality Improvement Program. The New York Chapter of the AAP was established in 1949 as an endorsed Chapter Affiliate of the national organization. The AAP is a national organization composed of over 55,000 pediatricians. There are approximately 1,500 members in New York Chapter 2. Congratulation to Dr. Shetal Shah, who has received an Outstanding Achievement Award from the American Academy of Pediatrics this year! Welcome to our website! This Website is a publication of New York Chapter 2 and is intended to be a forum for information and communication among the Chapter membership, individuals and groups interested in the well being of children. The President of New York Chapter 2 is Steven Goldstein, MD, FAAP; Dr. Goldstein can be contacted through the Chapter office.